Citing severe procedural irregularities, the Supreme Court on Thursday acquitted a man sentenced to life in prison over drug trafficking charges. The unprecedented ruling deals with similar lapses noted by former president Mohamed Nasheed and former defense minister Mohamed Nazim, who were sentenced to jail on terrorism and weapons smuggling charges, respectively. In acquitting Abdulla Unais, the Supreme Court said he was not given access to a lawyer or the opportunity to call defense witnesses. Unais was arrested in Addu City in May 2012. Police officers found more than 46 grams of heroin in envelopes on the ground at the time of his arrest and in his trouser pockets. Unais had denied charges and claims he was framed by police officers. 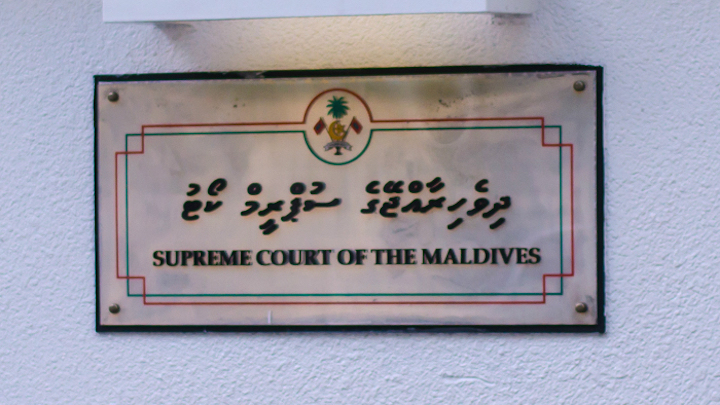 The Supreme Court said the lower courts should have investigated Unais’ claims of a police set-up by verifying if the accused police officer had left any fingerprints on the envelope. The ruling went onto question the validity of the police officer’s testimony. The criminal court’s sentencing of Unais without providing access to legal counsel contravenes the constitution, which states that the government must set lawyers for individuals accused in serious crimes, the ruling said. Unais, who had remained in police custody throughout the duration of his trial, had repeatedly told the criminal court he was unable to hire a lawyer, the Supreme Court said. 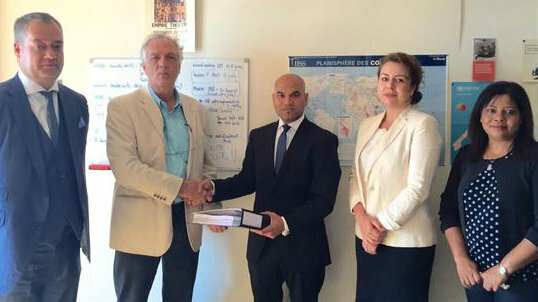 Nasheed, in a petition to the UN working group on arbitrary detention, noted that he was denied legal counsel at a first hearing. Then, when his lawyers recused themselves in protest over the criminal court’s refusal to provide sufficient time to prepare defense, judges proceeded with hearings, despite Nasheed’s repeated request to hire new lawyers. The government maintains due process was followed. A ruling is expected in September or October. 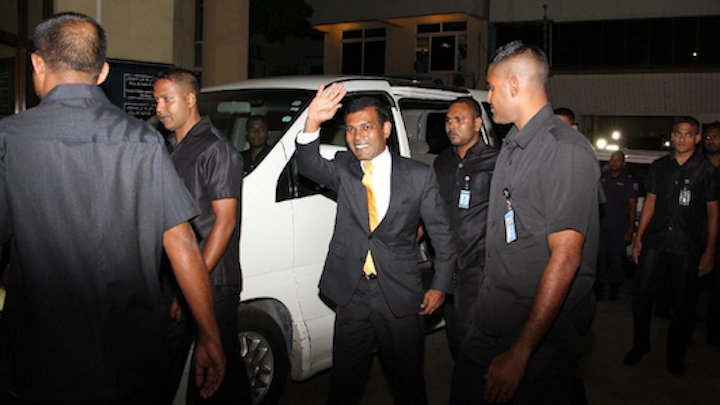 Nasheed’s 19-day trial was criticized by foreign governments and UN rights experts. The UK Prime Minister David Cameron, the EU parliament and high profile US senators have called for his immediate release. Nazim, meanwhile, contends rogue police officers had framed him by planting weapons during a midnight raid. The criminal court, however, did not allow the former defense minister to call witnesses to prove his case. Nazim’s lawyers also contend anonymized statements provided by the police officers involved in the raid are inadmissible in court. Appeal hearings in Nazim’s case have been stalled after the Supreme Court transferred two of the five judges on the panel to a newly created branch in Addu City. 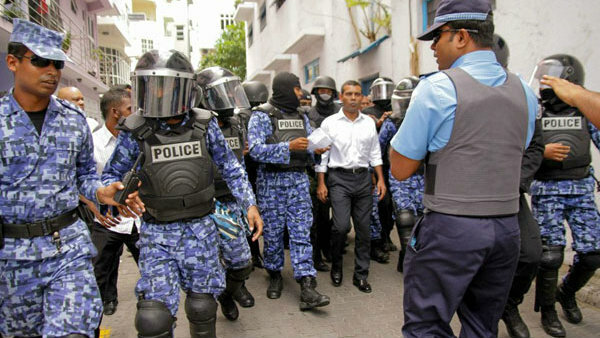 Nasheed and Nazim’s imprisonment triggered a political crisis with daily protests and historic antigovernment marches. The main opposition Maldivian Democratic Party is now negotiating with the government for the pair’s release. Nasheed is currently under house arrest. Devyani Srivastava is a Senior Program Officer (South Asia) at the Commonwealth Human Rights Initiative. She can be reached at [email protected]. Rejecting jailed ex-president Mohamed Nasheed’s appeal for clemency, President Abdulla Yameen has urged him to first exhaust all appeal processes in his terrorism conviction. “President Yameen responded to Nasheed’s letter with the same answer he’s always maintained – to complete all appeal processes,” said the president’s office spokesperson Ibrahim Muaz Ali. Nasheed is serving a 13-year-jailterm on a terrorism charge relating to the arrest of a judge during his tenure. The rushed trial was widely criticized for its apparent lack of due process. President Yameen’s letter was sent to Maafushi Jail. Nasheed’s lawyers maintain they have been blocked from filing an appeal after the criminal court failed to release a report into case proceedings within the shortened 10-day appeal period. The Supreme Court has removed discretionary powers granted to high court judges to accept late appeals, in the same ruling that had shortened the 90-day appeal period to 10 days, lawyers have said. 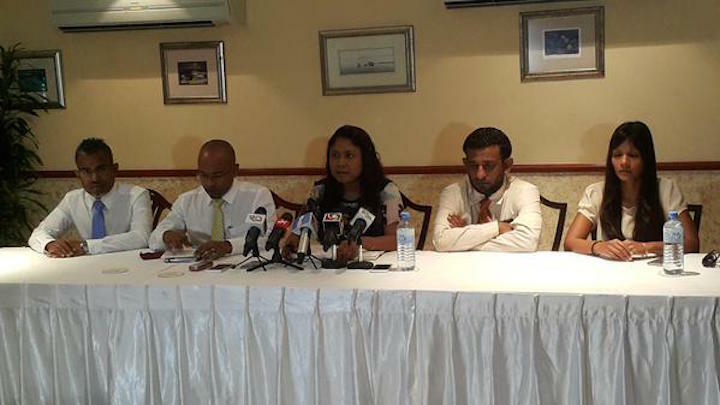 The government, however, insists Nasheed can still appeal. Meanwhile, two judges who sentenced Nasheed were promoted to the high court last week. The opposition leader has previously said he does not trust the Maldivian judiciary to accord him justice unless recommendations of judicial reform are fully implemented. 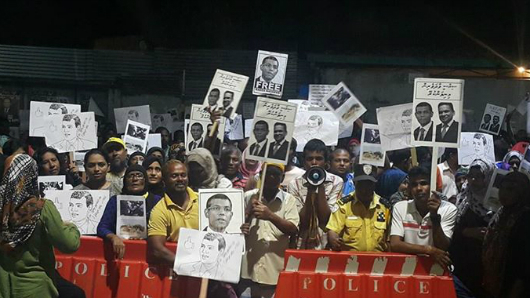 Nasheed’s imprisonment has triggered a political crisis with daily protests for three months, two historic mass marches, and the arrest of hundreds of protesters. 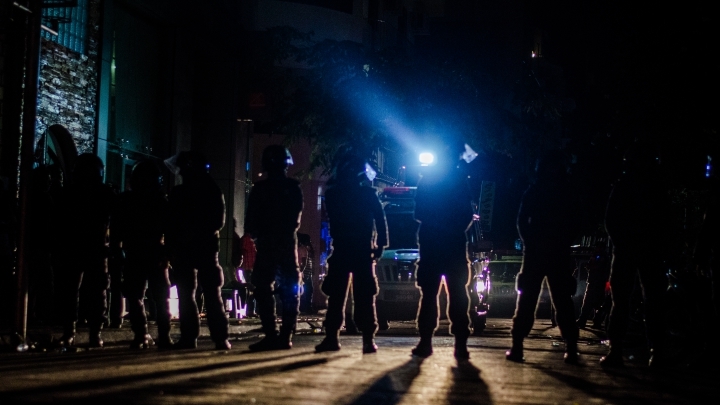 Three more opposition leaders have been charged with terrorism. 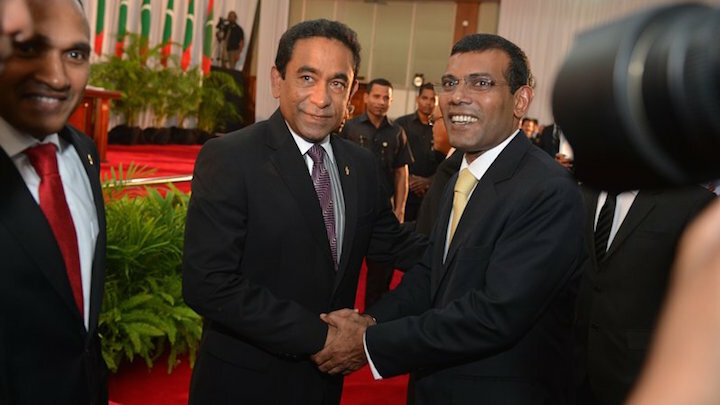 In the appeal for clemency, Nasheed’s lawyers noted that the Clemency Act grants the president the discretion, on the president’s own initiative, to commute the sentence of any individual convicted of a criminal offence. 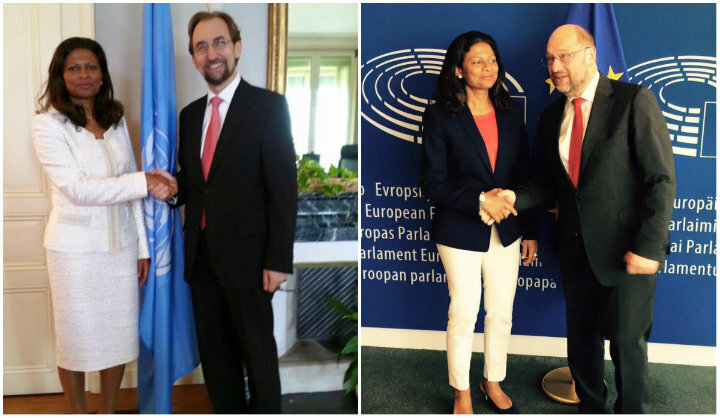 The European parliament in April adopted a resolution condemning the “serious irregularities” of Nasheed’s terrorism trial and called for his immediate release. The US secretary of state John Kerry said during a visit to Sri Lanka that Nasheed was “imprisoned without due process”. US senators John McCain and Jack Reed have urged their government to press for the release Nasheed and all other political prisoners in the Maldives.